Friday before last was the first of a series of warm spring-like days, and I went to two LYS, The Yarnery, and Borealis Yarns. The former because I was sent there in search for a specific pattern. No luck there, but I didn’t leave the area without a stop at Cafe Latt� for a yummy snack. I went to BY for the Crystal Palace “Party” I needed to finish Mom’s scarf, but they did not have Jet Black in stock. The clerk said they would be ordering more and it should arrive next month. That store is somewhat dangerous for me, because the “Party” yarns are stocked right next to a veritable Wall of Sock Yarn. Just a little teeny bit came home with me. 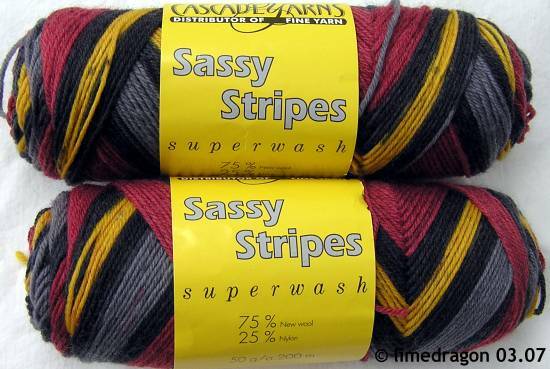 The maroon and gold stripes in this colorway just scream U of MN, and I’ve already personally renamed the colorway “Goldy.” I plan to knit socks with this for someone else, but I’m so tempted to get more for myself. Saturday: Busy with errands, finished both toes. Sunday: Knitted through most of the day, finished the insteps and heels on both socks. Monday: Worked all day, then knit one leg/cuff. Wednesday: Frogged all of what I had knit. Yes, you read that right. My Mad Cows are no more. There was too much coordinating brown in the handpainted skein for a good contrast. I do like the painterly effect achieved, but I decided I didn’t want socks with this effect right now. It was lots of fun to see the great combinations people used for their socks. (Solid with solid, solid with variegated, solid with self-patterning, variegated with variegated, etc. There’s a Flickr pool, too.) I think the handpainted yarn I used would work better with a light color, like white, cream, or even pale green. So back into stash they went, for now. Someday I’ll try this pattern again, but there will be more patterns released during the tournament, and I might want to knit some of them. Not silly at all. Why do you think they put so much thought into naming the colors? Love that Cascade. You should definitely have some for yourself. Other than the silly name, I enjoyed knitting the Sassy Stripes socks I made a few weeks ago (they were in a traveling rib pattern). You should get some of the yarn for yourself! What plugin are you using for your pictures now? I like the popup aspect. I used to work at one of those stores! Here I thought you were going to leave me in your dust! I’m sure I won’t make it past the second round of Sock Madness – Stephanie’s group appears to be the most competitive of the three groups.